Graham W.J. Beal recently announced that he will retire this summer as director of the Detroit Institute of Arts after 16 years at the museum. During that period, he has overseen a significant renovation and reinstallation project (2001–07), which focused on improving how the general visitor engages with the collection, and been lauded for steering the museum through serious financial difficulties. Under his leadership, the DIA secured a local property tax in 2012 to support museum operations while it builds its endowment; and with the ‘grand bargain’ deal of 2014, the collection has been safe-guarded against deaccessioning proposed as part of Detroit’s bankruptcy plans. Why does now feel like the right time to retire? In a way, I can say that I’ve done everything I came here to do. Even if the reinstallation of the whole collection isn’t complete, because we’ve been stymied by a couple of major crises, I felt that this was a good time to step aside and ask someone else to take on the DIA. In your first years in the post, when you were concentrating on a major capital project, did you have any inkling of what was coming? Well, we definitely had plans for future expansion of activities and outreach. But even before the museum reopened to the public late in 2007, we had become aware that our business model, as people say these days, was broken. We already knew that we had to reduce our expenses as much as we could, and so, although the opening was exciting, I could see we had some tough decisions coming up. Our willingness to do everything within our power to reduce costs helped win over individuals who were sceptical about voting for the tri-county property tax. And did the success of the renovation project – and the care it took over types of access – also then stand you in good stead? Yes, that was crucial. I feel confident in saying that the old DIA, worthy though it was, would not have been able to pass that vote. I’m most proud of the fact that we convinced people that we were important, if not essential, and that for a small amount of tax money from everybody, we were something that really should be kept around. I know all this jargon pains some people, but really focusing on the non-specialist visitor and the fact that, as we said in our campaign, art is for everyone…the tax wouldn’t have been passed without getting that across. From the outside, the battle to secure the DIA and its collection looked like a tremendous struggle. Were you always confident that it would be resolved in the museum’s favour? But the valuation of parts of the collection in 2013 wasn’t simply a rhetorical ploy on the part of the city’s emergency manager was it? No, it wasn’t. But the emergency manager’s colleagues started off thinking that they could evaluate the whole of the DIA collection in a matter of months. So you were dealing with individuals who had a lot to learn. There was a lot of learning on both sides. As we started to look into things, we began to discover that ‘City of Detroit purchase’ didn’t necessarily – in fact often – didn’t mean that city funds had been directly used to buy art. The most difficult thing was that there were so many unknowns, but we knew we were fighting for our lives. The DIA is one of those great American museums that have historically represented both the aspirations and changing fortunes of their cities. In difficult times like these, what role should it play? I think it’s fairly well accepted now that museums are social enterprises in a way that we didn’t think of them as being 30 years ago, when they were more like libraries – collections you could access if you wanted to. There’s been a very interesting shift: without abandoning core activities, we need to pay more attention to making people understand and enjoy why we can have some meaning in their lives. Yes. It really is a massive failure of fiduciary responsibility. One of the options that we had when we were looking at the long-term future of the DIA was to sell art, and there were noises around town to suggest that’s what we should be doing. To some people who have run businesses it makes perfect sense. You have assets and you can get rid of them without mortally wounding the institution. But art’s not that kind of asset. 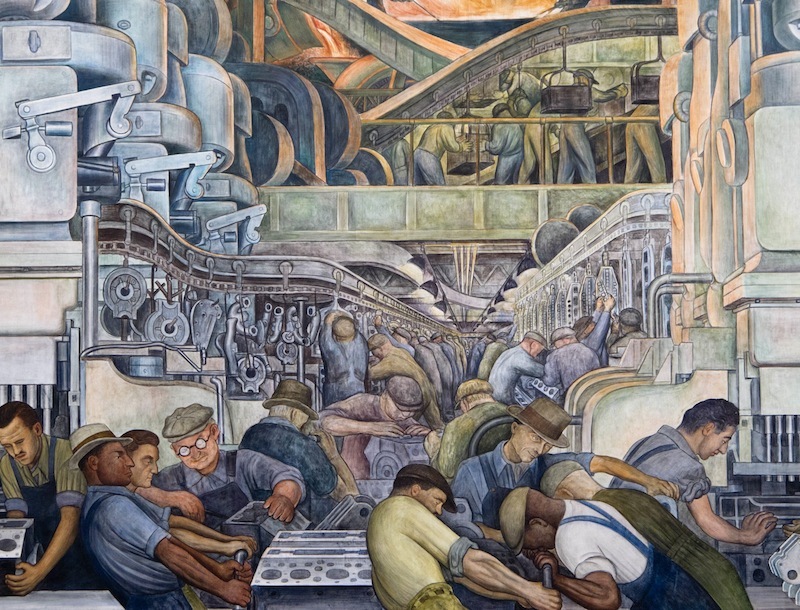 Diego Rivera’s Detroit Industry Murals at the DIA have recently been designated a National Historic Landmark, which makes ‘Diego Rivera and Frida Kahlo in Detroit’ (15 March–12 July) a timely exhibition. But it’s also quite a personal project, isn’t it? So much so that I would’ve loved to have had time to curate it myself. It was an idea that I had about 10 or so years ago – at least, I was thinking about how central Rivera was for the US art scene in the 1930s. That would have been a big art-historical exhibition. When things began to settle down, and we knew we had a life ahead of us after the passage of the millage, I made the decision to go back to the human story of those two individuals in Detroit in the early 1930s. One came at the height of his fame to produce what he and many others regarded as his finest mural cycle. And Frida Kahlo was really completely unknown, unformed as an artist, when she came here, without any attention being paid to her while her husband was being fêted. But then the Frida Kahlo who leaves Detroit, after the tragedy of the loss of a child, emerges from a chrysalis, as it were. In the last 30 years or so, of course, it’s all been about Frida. Is there something allegorical about the show, given the recent history of the DIA? I think when you looked at the murals two years ago you saw an elegy, a way of life that had completely gone, a ferocious energy and creativity that didn’t seem to be around. Now when you look at them you see not the past, but a kind of representation of what the future can be.